Once mostly vacant and deteriorating, Washington Avenue today has reversed decades of urban decline to become one of St. Louis's most popular districts. This downtown corridor — replete with residential and office lofts, boutiques, restaurants, and nightclubs — pulses with activity not seen since its garment district days, a time when sidewalks were filled with window-shoppers and buyers. A virtual museum of late 19th and early 20th century warehouse architecture clad in brick, stone, and terra cotta, this monumental corridor imparts one of St. Louis's most cohesive vistas. Fifteen blocks between Eads Bridge to the east and 18th Street to the west. Washington Avenue, a monumental corridor through St. Louis, resembles an urban canyon with stately showcase buildings. Enhanced landscaping, new street furnishings, custom lighting, and improved sidewalks were part of a $17 million renovation in 1998. Photo courtesy of Connie Tomasula. The view west, from the foot of the Eads Bridge, is of an urban canyon lined with showcase buildings that create a distinctive sense of place through their attitude, size, scale, and materials. The avenue's building stock reveals the artistic considerations that figured prominently in the creation of buildings that often served as both corporate headquarters and manufacturing facilities. The impressive architecture and scale of the avenue reflects the rich history of St. Louis, a city once on the nation's western fringe that grew to become an industrial powerhouse and population center of national significance. Washington Avenue gradually lost its vitality because of a decline in domestic garment production following World War II. Its functionally obsolete buildings stood vacant or underused. In the 1980s, loft rehabbers arrived but, unable to create a sense of community or security, their attempts to spark an economic revival of the area fell short. However, a move to list two segments of the street on the National Register succeeded in 1987. It was the State of Missouri's 1998 adoption of a historic rehabilitation tax credit that resuscitated Washington Avenue by making large-scale reuse projects financially feasible. Investment — more than $100 million — poured in soon after. Meanwhile, the city began implementing its 1999 Downtown Now! 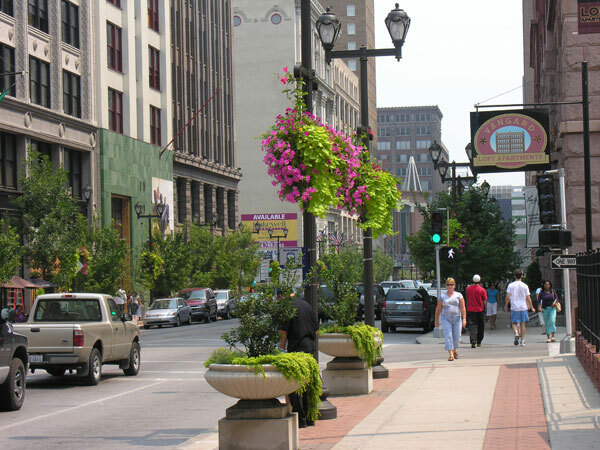 Development Action Plan, focusing first on Washington Avenue's streetscape. Using $17 million in state and federal funds, it expanded public amenities, installed custom lighting, added and improved street furnishings, and enhanced landscaping and sidewalks. Innovative pavement types were varied to calm traffic. A zipper-and-stitch-like paving pattern down the center of Washington Avenue — highlighted at night by LED-lit buttons — pays tribute to the history of the garment district. Pedestrian-friendly Washington Avenue is popular with bicyclists, dog walkers, and stroller pushers as well. The street maintains a shared-use bicycle lane and is part of the city's bicycle network. Two subterranean light rail stations serve the street — one at the historic Eads Bridge and the other at 6th Street. A "curbless" stretch between Tucker Boulevard and 14th Street gives the appearance of an unimpeded civic space, lending itself to street festivals and celebrations. An increasing number of Washington Avenue's buildings boast large, elaborate, colorfully lighted signs. The street is punctuated each night with neon, boldly declaring its vitality. 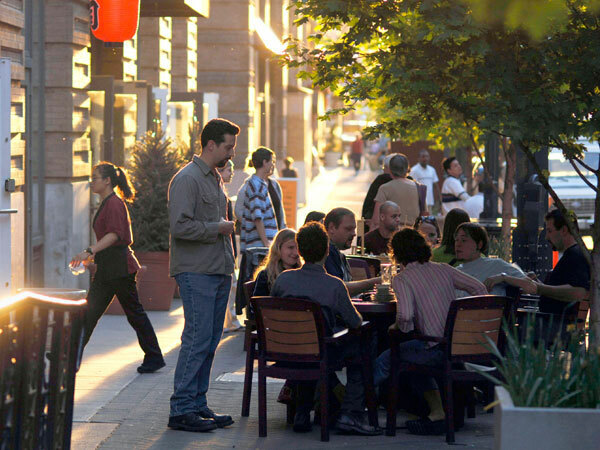 Office workers and tourists join a growing downtown residential base – currently around 8,000 – in supporting street-level retail and outdoor dining along Washington Avenue, part of a major employment center and adjacent to a convention center, sports venues and civic buildings. Photo courtesy of Connie Tomasula. City Museum — interactive Exploratorium for all ages – opened in 1997 in former shoe factory; attracts more than 700,000 visitors annually. Pedestrian experience enhanced by street-level retail and public open spaces. Wide sidewalks encourage walking. 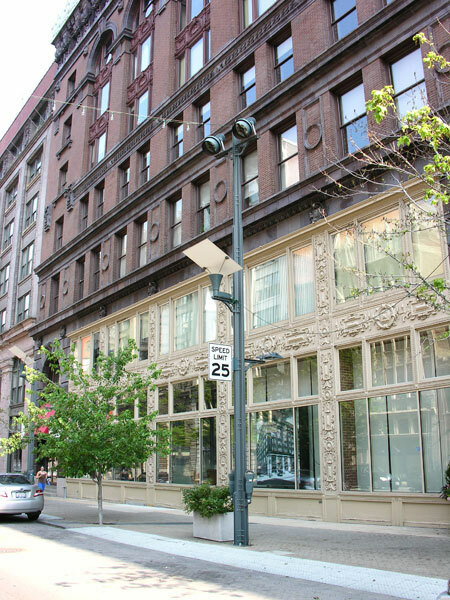 Late 19th and early 20th century warehouse architecture dominates Washington Avenue, where artistic considerations influenced the facades of buildings that often served as both corporate headquarters and manufacturing facilities. Washington Avenue runs through two National Register historic districts. Photo courtesy of Connie Tomasula.